The three man dream team of M.E.D., Blu, and Madlib join forces once again for their new album, ‘Bad Neighbor’. Dropping October 30th, this full-length LP incorporates songs from the utterly delightful “The Burgundy” EP which they released in 2013. With Madlib on production and M.E.D. and Blu on vocals, ‘Bad Neighbor’ promises more funky vibrations laced with creamy flows. As if this team of hip-hop big men weren’t enough, the album is elevated with a killer roster of players including MF Doom, Phonte, Dãm-Funk, and more. An album so jam-packed, it’s nearly splitting on its sides. Undoubtedly a most awesome way to soundtrack the transitioning season, an equally epic listening party takes place tonight at Grand Star Jazz Club in DTLA’s Chinatown. Special guests of the evening include DJ Rhettmatic and DJ Babu of The Beat Junkies, as well as Exile reppin’ Dirty Science. 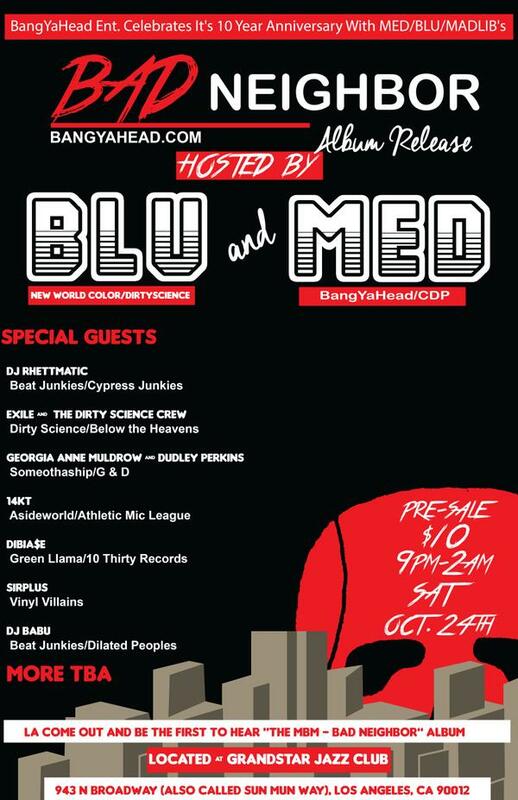 Come through and enjoy a first listen to ‘Bad Neighbor’ with some very, very good company. ‘Bad Neighbor’ is available for pre-order on iTunes, but while you await its release, you can peep track 7 on the LP, “Knock Knock” featuring the villainy of MF Doom here.